You’ve chosen to display a Twitter wall at your event. That’s a clever move, because streaming live tweets has some serious advantages. Now it’s time to decide how you’d like to deploy it exactly at your event! To inspire you, I’ve collected some use cases that show how TweetBeam Twitter walls were successfully used. Here are 4 different ways to display a live Twitter stream at your event. At big events with a stage, Twitter walls are mostly displayed on a big screen, non-stop. They impress and entertain attendees. 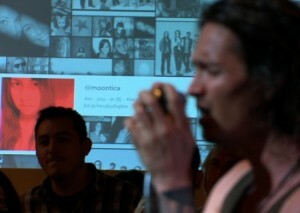 During a concert or presentation, attendees can see and react on each other’s tweets. Rock band Incubus used TweetBeam for Incubus HQ Live, to connect with their fans while making live music. Worried that live tweets distract your guests from the speaker’s actual presentation? Then only display your Twitter wall after a presentation, to wrap it up. A Twitter wall is the perfect way to run a Q&A session. 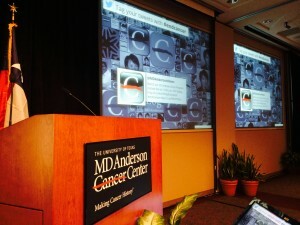 At the event of MD Anderson Cancer Center, for example, attendees of lectures were motivated to tweet their questions after the talk. The speaker saw all the questions appear on the TweetBeam show, and could easily reply to them. Don’t want your guests to get bored during dull moments? A Twitter wall can help you to entertain your guests. In between two talks, for example, you can project a Twitter stream on a big screen on stage. Your attendees won’t have a chance to start yawning, while they wait for the next speaker. Another great idea is to set up a Twitter wall in less stimulating spaces, where people usually tend to do nothing but… wait. They will love to fill dull moments with reading and sending some tweets. The company Ricoh realised that. 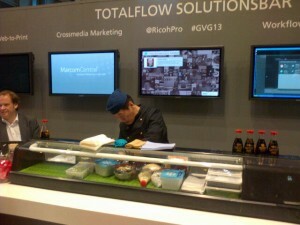 At their event, they cleverly set up a Twitter wall at a sushi stand. It caused distraction and entertainment for hungry guests, while they were waiting for food. With a Twitter wall, you can make your trade show booth into a real success. There are lots of creative ways to use a Twitter wall at a trade show, but even a simple display of live tweets will drive attendees to your booth. Oracle Corporation definitely stood out with their visually appealing TweetBeam show. We hope the examples above gave you some ideas where and how you can display live tweets at your event. Did you read my previous blog about why you should display a Live Twitter Stream at your event? Depending on how you use it, a live Twitter wall can serve different purposes, for any kind of event. Whatever your goal is – to amaze, entertain, motivate or attract guests – a Twitter display at the right place at the right time can do the trick. What is your favourite use of a Twitter wall? We’d love to hear! Share it with us in the comments below. PS: If you liked this post, you might want to sign up for our newsletter! Pim Stuurman is one of the founders of TweetBeam (the pretty way to display tweets). In his spare time, he enjoys hurting his brain with mathematics and his legs with basketball. TweetBeam is a visually engaging Twitter wall for events and websites, built in Amsterdam.